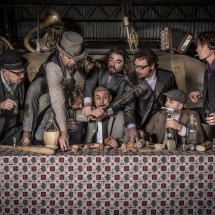 Oneiric, lysergic, eclectic, furious, irreverent… RADIO*ZASTAVA are unique within the varied scenario of European bands with an Ethno Balkan music background. 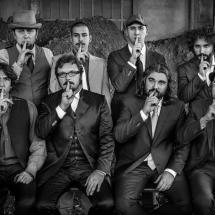 Active since 2005 and coming from the multi-cultural town of Gorizia, the eight members of the band have Italian, Friulian, Slovenian, Austrian and Bosnian-Serb origins. 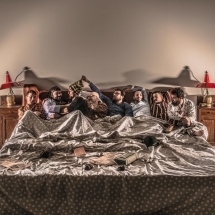 Really few bands can combine an in-depth knowledge of Eastern Europe’s most intricate rhythms, harmonies and melodies with a variety of music genres ranging from swing to free improvisation, from reggae to the most diverse electronic impulses, enriched with tremendous drive and great theatrical skills. 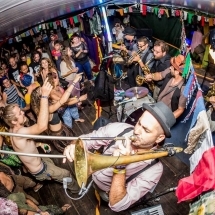 In 2013 they played in the main stage at Guca`s Festival, the world’s greatest balkan brass festival, where they`ve been awarded with the second prize as best band just behind Serbian contestants. 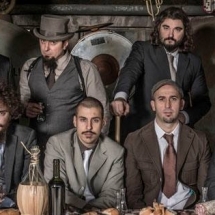 In 2014 they`ve been chosen as opening act for the European Reunion Tour with Emir Kusturica and Goran Bregović playing in some of the most important European clubs as the iconic Zenith in Paris. In 2015 they opened the funeral cerimony for the Queen of circus Moira Orfei. Almost ready for releasing a new cd, Radio Zastava are prepearing a renewed live schizophrenically combining an original improvised electronic, lo-fi dj set with a powerful virtuosistic brass wall of sound.